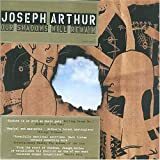 The first and most striking thing about Josepth Arthur’s work is his vocal delivery. This singular thing is most likely to turn people off his work in many ways like the average reaction to Bob Dylan’s vocal performance. This is not to say that his vocals are as demanding as Dylan’s (well atleast in my opnion). His delivery at the at its loudest can come across as a blues shouter as much as anything else, but much of his delivery is a lot slower and quieter, the only point of reference that comes to mind is taking Leonard Cohen and speeding his delivery up slightly, raising it an octave and making it slightly nasal. But what adds the unusual nature of the vocal is Joseph’s tendency to adding a choral/reverb effect to his voice, making things a lot easier to listen to. If you are comfortable with this vocal sound then you’re in for a treat, as Joseph’s strength isn’t his vocals (and he recognises this – hence the processing) but the music and song writing which have improved with every release, and his debut Big City Secrets was no light weight to start with. The album’s musical range is very broad from acoustic based tracks like Echo park through to more rocky stuff like Stumble And Pain. The later even incorporates string sections which feel perfectly natural. This is probably his most accessable album to date, some might say the most mainstream. But I’d recommend any self respecting music fan to give this album a chance.